A while back, I received a coupon for Simply Potatoes as part of the Foodbuzz Tastemaker Program. Simply potatoes are supposed to be fresh and never frozen, prepared potatoes. 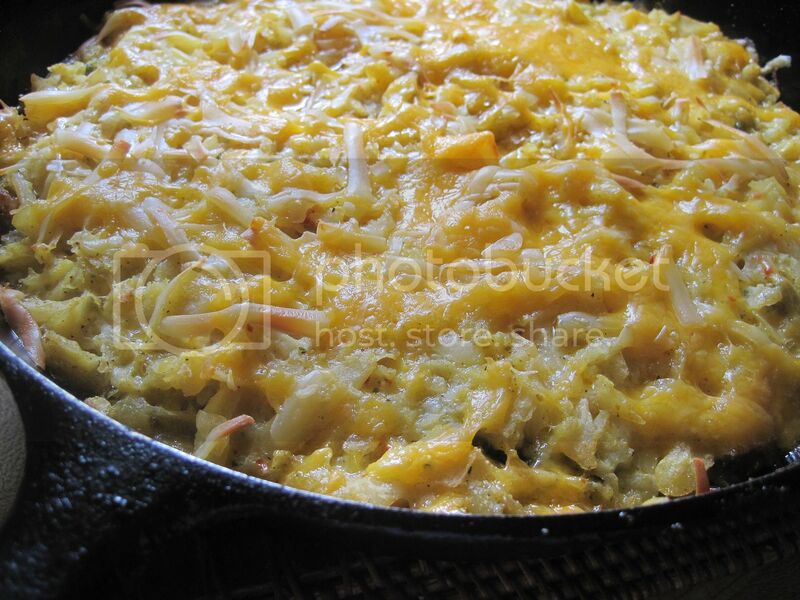 They have been peeled and shredded and some even already pre-seasoned as the Southwest Style Hash Browns that I used in this recipe. Of course, you don’t have to use the packaged stuff; you can always peel and grate your own as I am normally wont to do. This is a fairly quick casserole that I put together one weekend just to try out Simply Potatoes, and it turned out quite well, if I do say so myself! The girls said you couldn’t tell that the potatoes were pre-packaged so that alone was a good endorsement for me. However, for the cost, it is of course still cheaper to peel and grate your own potatoes, but for the convenience, Simply Potatoes does quite nicely. 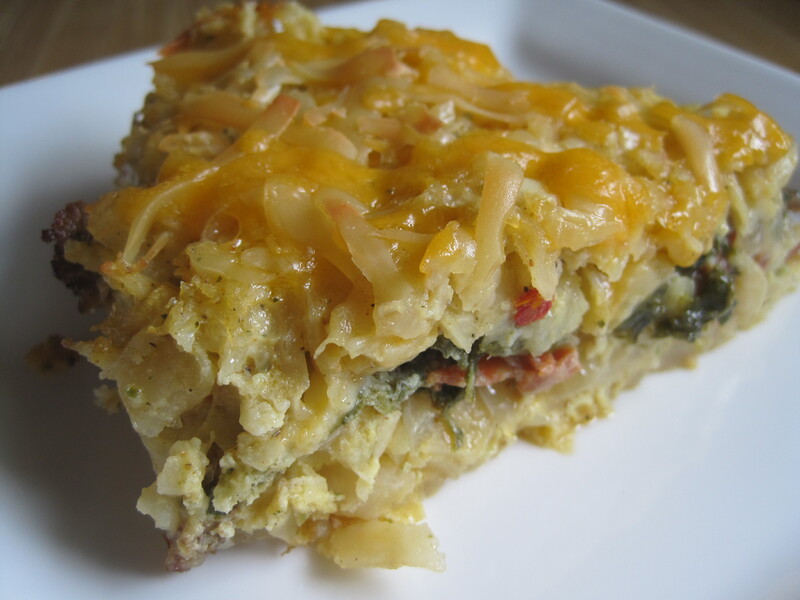 Perfect for a filling breakfast or brunch, this casserole utilizes common pantry items and flexible enough to use up leftovers. Scramble eggs, milk and nutmeg together, set aside. Heat a cast iron pan over medium heat and brown the sausage until it renders fat. Add the garlic and onions and let it cook for a few minutes until fragrant. About 2 minutes. Add the pepperoni (optional) or any other meat item you have on hand. Add whatever vegetables you have, in this case, turnip greens. Let it warm up for a minute or two and remove the mixture from the pan. Turn off the heat. In the same cast iron pan, spread half the pack of Simply Potatoes to cover the bottom of the pan. Next layer, spread the sausage/vegetable mixture and top with a half cup of cheese. Add the remaining pack of Simply Potatoes and pour the scrambled egg mixture evenly over the pan. Top with the remaining cheese. Place the pan in the pre-heated oven and bake for 20-30 minutes until bubbly and the cheese is melted. Note that this dish aims to utilize whatever leftovers you have or ingredients readily available in your pantry. Cheese - I had a small amount of cheddar and swiss so that's what I used. This will change depending on what I will have available next time I make this dish again. Vegetable - I had about a cup of turnip greens so I used that. You can use spinach, broccoli, mixed vegetables or whatever else you may have. Meat - I was cooking Neese's breakfast sausage for the husband so I simply broke off a bit of that to flavor this version. I also had a small pack of pepperoni from when the Clone made pizza so rather than let it go bad, I sliced them up and used them for this casserole. As you can see, this dish can be very flexible and adaptable. Don't be afraid to try different variations. 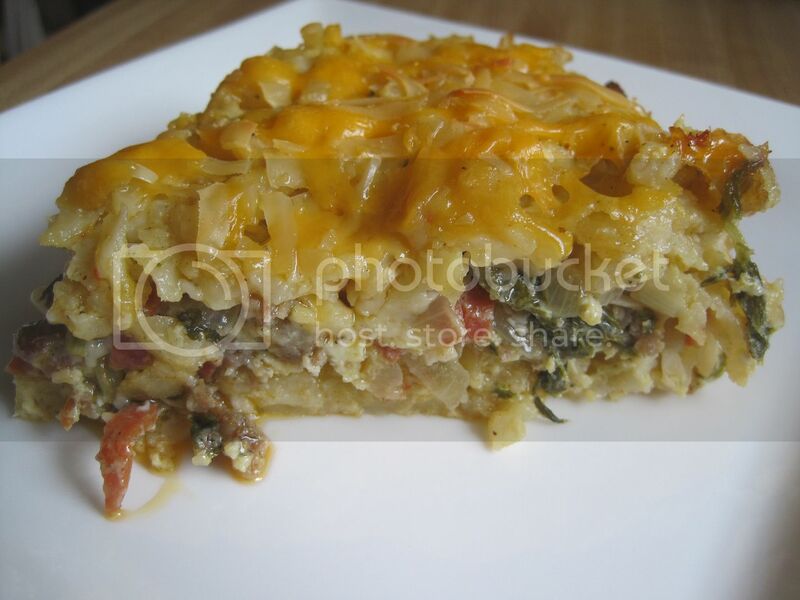 And this Sweet Potato Oatmeal Breakfast Casserole sounds good and healthy to me!